Just How Efficiently Does The Volcano Vaporize Weed? We’ve wondered from day 1 exactly how much THC is left in the ABV / AVB / Volcano Poo produced by our Volcano. Finally, we had the opportunity to do some semi-scientific testing. The results are surprising – there is much more THC in the already been vaped bud than I would have imagined. We started with 2 grams of Golden Goat from our local dispensary, and finely ground the buds in a grinder. 4 samples were divided from the ground material, .5g each, with one reserved as a control. All 3 samples were vaporized at a setting of 6 (which equates to 190°c or 374°f) on a Volcano Classic with easy valve and a standard size bag. Method 1: Fill 4 bags. Method 2: Fill 6 bags. Samples were analyzed by LuvBud from Fort Collins, Colorado. Unsurprisingly method 3 extracted the most THC from the herb. All of the methods completely extracted all the terpenes, which explains the rapidly declining flavor profile the further you go. Bottom line, our most efficiently extracted sample still contained 48% of the THC available in the sample. Even after 6 bags with stirring in the middle, the potency of the leftovers is 9.34%. That means 1 gram of ABV of this strain potentially has 93mg of THC, which is nothing to sneeze at. 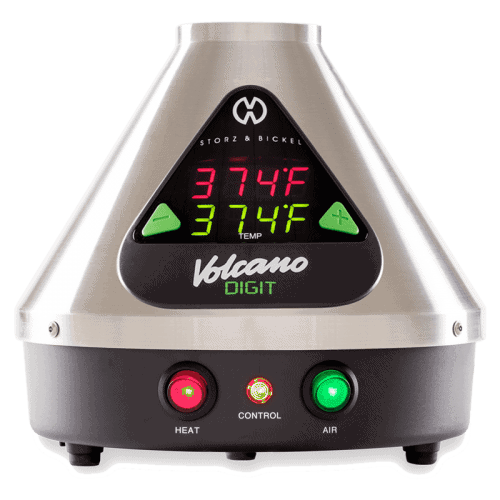 New Thoughts on Volcano Vaporizer Temperature Setting – 6! what temps did u use? can you guys publish what temperatures you used? Indeed, see reply to above comment. Updating article to be more specific. Thanks! Wow that’s really interesting !